According to Roland Berger, a strategic consultant company, ”ASEAN Integration opportunities lie in the reality that movements of people, goods and money grow more brisk across national and regional borders”. This integration opportunity can be harnessed by a prepared organization. One of the departments or critical success area that should be equipped in order for an organization to be qualified as prepared is the sales department. Selling as a science and art have evolved tremendously. It is no secret that sales is the lifeblood of any organization. In order for the organization to continue its march forward it must generate sales. The ASEAN Integration will pose a challenge to the sales group of all companies as it competes in close range with other sales group of different organizations of different countries that is now moving freely. This fact creates a need for a powerful culture and sales group. The Philippine companies must act on this trust swiftly. In this line, for the very first time, the Philippines will get to experience and learn from one of Asia’s Top Sales Trainer. This will prepare the participating companies and individuals to get a taste on how to compete in close range with their ASEAN sales counterparts and win. 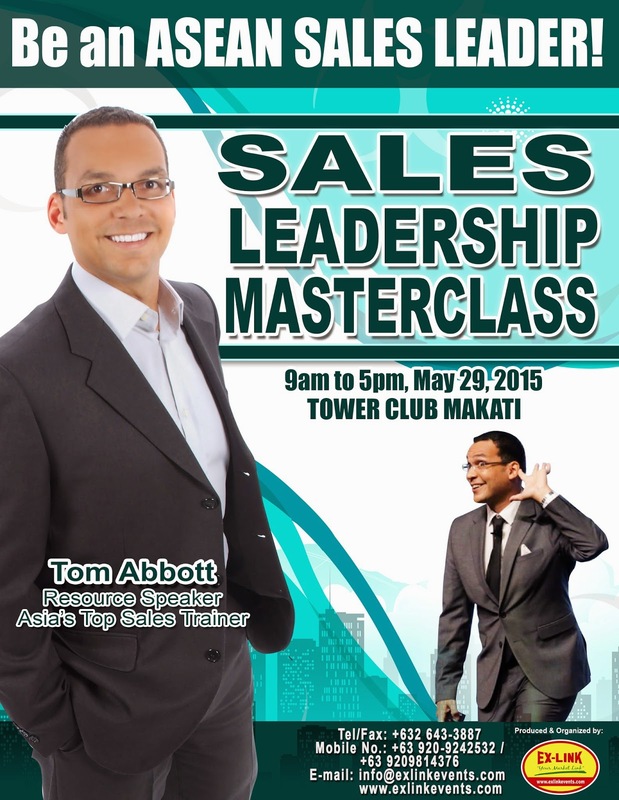 Tom Abbott, one of top Asia’s sales trainer, will conduct a Sales Leadership Masterclass, set this May 29, 2015 at the Tower Club, Makati City. Building a high performance sales culture. Tom Abbott has shared his expertise to the following companies in the past: Motul, Singtel, Electrolux, National Geographic, Fuji Xerox, Crocs and Hewlett Packard to name a few. Tom Abbott has already brought his expertise to Cambodia, Malaysia, Indonesia, Thailand and Singapore. The Tom Abbot Sales Leadership Masterclass is produced and organized by Exlinkevents – one the Philippines top business events management company. For partnership call tel. no. 643-3887 or email info@exlinkevents.com.